Order now and book an unforgettable experience! Please contact us to schedule your ride. Everyone can learn how to ride motocross, enduro or dirt bike! Whether you want to take your first steps on a dirt bike or go pro on off-road tracks for advanced riders – we offer fun, hands-on courses for all levels. Throughout the season you can be sure to find us either on a motocross track or in the desert of Dubai, where we enjoy some enduro riding, dune bashing or desert riding. We are passionate about motocross and off-road riding and equally passionate about passing on our expertise and experience. You have always dreamed about dune bashing and off-road riding in the desert? We can make this dream come true! We organize tailor-made training courses in Dubai according to your skills and level of expertise (please note that this course requires off-road and motocross experience as well as basic riding skills). Join one of our groups, book a course for you and your friends or treat yourself to private lessons with Arab Motocross and Motorbike Champion Mohammed Balooshi or two-times European Champion Chris Moeckli! At the MX Academy we run fun, hands-on training courses for all levels. In our beginner’s courses we will teach you how to handle your bike and make your first steps. At the end of the day you will even be able to do your first jumps! Don’t worry, if you have never ridden a dirt bike before – most of our participants haven’t. In all of our courses you will be provided with a complete set of riding and safety gear and you can rent one of our fully-equipped motocross competition dirt bikes or motorbikes. Of course you are free to bring your own bike and gear. Please note that we especially provide smaller bikes for kids and women. 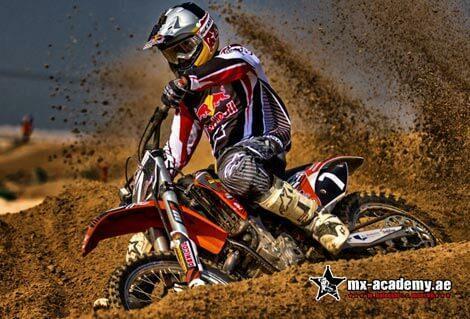 Riders planning on starting a career in motocross will be in the very best hands at MX Academy. We arrange for long-term riding training and physical training to prepare you for the high standards of the professional dirt bike scene. Our long-term training includes working on and perfecting your riding skills such as standing and sitting correctly, braking and accelerating, placing your feet and shifting your body weight on the footpegs, using the throttle control and improving your jumping techniques. More advanced riders will learn how to analyse dirt bike tracks, improve their start, get the holeshot right, ride ruts and many more. Furthermore we design customized workout plans to get you in shape. Are you looking for an adventure or a challenge? Are you dreaming of an one-of-a-kind experience? Are you thinking about making your childhood dream come true? Would you like to improve your riding skills? Would you like to spend an unforgettable day with your colleagues or friends? Would you like to improve the team spirit within your company? Are you toying with the idea of making someone an extraordinary present? Would you like to feel safer and more in control on a motorbike, on- and off-road? Would you like to push your limits? • Do you have a kid who likes dirt bike riding? Are you an enduro rider who wants to further improve his riding skills? Do you want to know what it feels like to control and master an off-road bike? Do you want some flight lessons? Please contact us for more detailed information and for inquiring about course dates. We will be happy to provide the information in English and Arabic. Book your motocross, dirt bike or desert ride adventure today!